Does your church close the office doors during federal holidays? We just celebrated Fourth of July. It just happened to be on a Monday. Through all the excitement of a three day weekend, fireworks and pool parties, some churches were still open for regular business. All of us at Reach Consulting? We took the day off to celebrate our great nation. We find great inconsistencies among churches with which holidays they allow staff to take off. We’re not talking about holidays that land on a Sunday like Christmas or New Years sometimes do. Deciding whether to have Sunday church that lands on an actual holiday is a different topic to be covered another time. We’re talking about holidays that land during typical Monday thru Friday work weeks. Five of the ten federal holidays typically fall on a Monday. The others are on specific days and rotate around. Then there’s the ever-faithful Thanksgiving…always a Thursday! I remember growing up in church where the choir presented the Armed Forces Medley song to celebrate and show respect to all the Veterans from all five branches of the military. It was always on the Sunday closest to July 4th. During the song, all the Veterans were asked to stand up and everyone clapped. It was to honor those who had fought for our country. But the staff still worked on that holiday. It just never made sense to me. Years later, working at a large church, I remember getting a phone call from an African American parishioner who asked why the staff was working on Martin Luther King, Jr’s birthday. It seemed quite trivial to me, until he asked the pointed question, “Does your all white staff not feel the need to honor the black community to which you present the Gospel?” I was guilty. I had never thought of what it meant to our African American constituents that we did not honor the day that our own government had set aside for us to honor. After that phone call, I worked to make the adjustments for the following year. We recognize that some holidays may seem more important than others. Christmas is certainly more important to us than say, Columbus Day. But all of the federal holidays have been chosen for a reason. A reason that must be strong enough for Congress to decide it should be a holiday. In addition, these days may mean something to your people. You may not feel like Veteran’s day or Memorial Day is important, but somebody in your church still hears the gunfire from that terrible war. Someone still misses their loved-one that never came home. Many people may still experience racial tensions. Holidays are important to celebrate, to remember, to honor, to reflect. In addition to honoring the respective purpose of the holiday, it also gives your staff a day of rest. Most church staff members could use an extra day now and then. Church work is hard. It can be draining. When was the last time you celebrated your own staff and told them to just not come in to work? To take a day off and relax with family? To take a holiday? 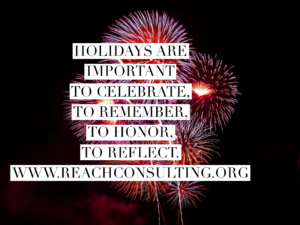 At Reach Consulting, we take off all the federal holidays. Our own churches do as well. What holidays does your church give to staff?